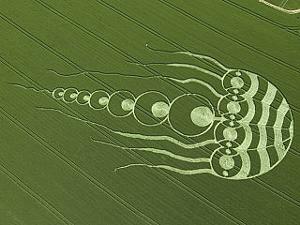 This find suggests aliens have become more fascinated with sea life and have grown tired of the usual circle designs. Perhaps there is a new alien flying the special modified UFO which creates crop circles? By Pineappleope.com measurements, this crop circle is roughly 3 times as large as most of their previous crop circles. “Its a complete monster” says crop circle enthusiast Clark Sven. The landowners Bill and Sally Ann Spence, on which the aliens drew the crop circle, are absolutely beside themselves. Their rage is growing by the minute and have called in the Oxfordshire FBI to get to the bottom of this. Sources say they will sue the aliens for lost barley revenue.